I loathe keeping house. Okay, perhaps that’s a wee bit extreme. I don’t loathe all of it. Just certain aspects. Like emptying the dishwasher, folding laundry, ironing and cleaning bathrooms. Add to that putting away clutter and picking up socks off the floor. Like seriously, why are there socks left willy nilly in this house? And not even discarded together. 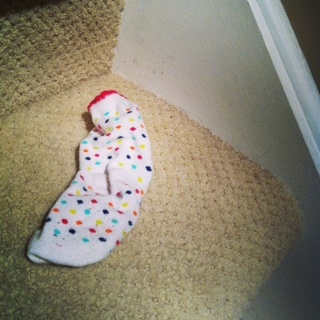 I’ll find one sock in the family room and another on the steps leading upstairs. I want to ask my family: what happened? You took one sock off over here. Then another over there. Why? Why the long the journey across the house to remove the other sock? I don’t ask because I know there is no answer. Much like asking why is the sky blue or why a grown man must scratch his junk in public, it is what it is. On a side note, what’s up with dryers periodically eating socks? Like is there a sock tax I’m unaware of that all dryers demand? I see the socks go in and yet only one of a pair comes out. It’s as if the dryer is self-righteously proclaiming: Yes human, for every four permanent press cycles completed, you will give up a sock of my choosing. I know there are people who love housework. Find it relaxing and dare I say, enjoyable. You people who say this and mean it? I don’t understand you. I also don’t believe you and feel the need to tell you that are you most likely causing untold damage to your psyche. Stop the lies. Just. Stop. While there’s about a million other things I’d rather be doing, the housework I like don’t mind tolerate includes washing the dishes, doing laundry (but not the folding part) and mowing the lawn. Okay, the last one is outside of the house but it’s still work required of a house owner. I like mowing the lawn because it doubles as a workout. Multi-tasking. Killing two birds. One stone. You get my drift. I know a lot of men are the lawn mowers in their families. And that’s cool. But I find it funny that some men say things like, oh I don’t do the vacuuming. Or grocery shop. Or wash dishes. Well, I’m all for dividing up the housely duties. Because there sure are a lot of them. And honestly, if my husband didn’t vacuum it wouldn’t get done. Not because I’m lazy but because I have a sore shoulder and he doesn’t. Also, he’s a whole lot taller than me – not to mention stronger – so he can whip that vacuum around the house like nobody’s business. And sure, there’s definitely some things he’s better at than me. Like fixing the leak on our roof. And re-calking the bath tubs. And I’m better at cooking meals that aren’t half-burned, half-undercooked massacres. Yes when it comes to housework, there’s a give and take. That dishwasher? Unloaded every freakin’ day. And those bathrooms? Sparkly clean. Alas, there is no housekeeper in sight for me. And I like living in a shiny, sparkly clean house (truth: while the house may not always be this way it certainly is my preference). And so I continue to toil away at my housework. But I’m counting the days until Sweet Girl is old enough to take on some of the load herself. It’s why people have children, right? * Full disclosure: I avoid ironing by doing my best to not purchase clothes that require it. Random discarded sock Chez Gallant. *Any* housework can double as a workout. And that’s the only thing that gets me doing it (and believe me, that doesn’t always work either). Oh, and I hire someone to do the bathrooms. I don’t care about the workout, she can have it :). I just throw away the single socks. Eventually this leads to a natural balance and the odd trip to replenish the sock drawer. I swear my daughter sheds socks everywhere.